The agreement will allow the university to welcome visiting professors with unique expertise. 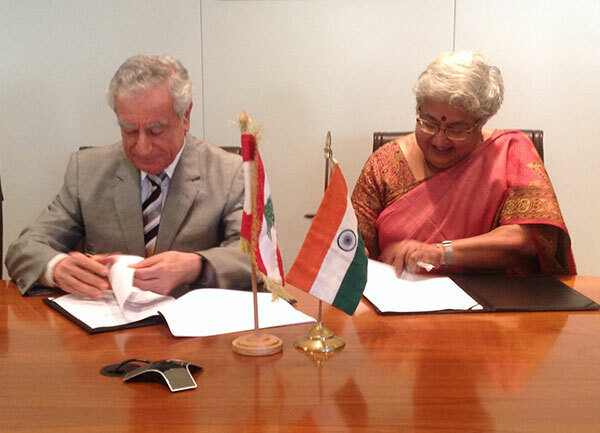 LAU signed a memorandum of understanding with the Indian Council of Cultural Relations (ICCR) yesterday, with the aim of establishing the ICCR Chair of Indian Studies, bringing Indian scholars to the university’s campuses. While LAU President Joseph G. Jabbra stressed the importance of exposing the students to a globalized world, India’s Ambassador to Lebanon Anita Nayar praised the initiative saying that it was a first-of-its-kind agreement between the ICCR and a Lebanese university. The agreement allows the university to specify to the ICCR the academic field of study it would like the chair or visiting professor to teach. “This gives us the opportunity to fill a gap by getting faculty members with expertise in fields that are in high demand and that we don’t necessarily have in the country,” Shahin says.